The wild turkey is native to North America and can be found over most of the eastern two-thirds of the U.S. with small pockets along the west coast and in Mexico. Wild turkeys prefer relatively open hardwood and mixed evergreen hardwood forests with scattered openings. Some turkeys can be found in woodlots relatively close to human population centers. Despite their large size, wild turkeys (unlike their domestic relatives) are agile fliers and roost in trees. Wild turkeys are social birds and live in flocks. Wild turkeys are omnivorous and typically forage on the ground for acorns, nuts, seeds, berries, fruits, grasses, roots, insects, and small amphibians and reptiles. 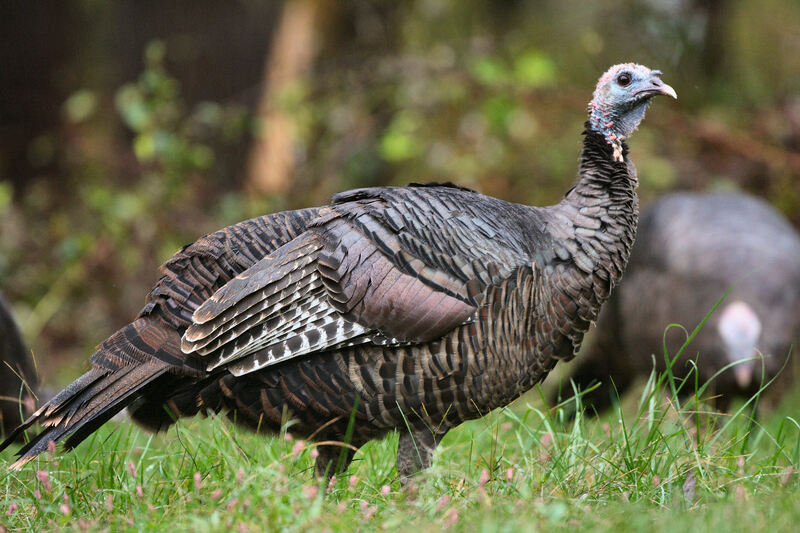 Wild turkeys often feed in cow pastures and favor croplands after harvest to scavenge seed on the ground. Turkeys can be attracted to bird feeders. Occasionally, turkeys may behave aggressively towards humans, especially in areas where natural woodland habitats are scarce or where people have been feeding them. They have been known to chase humans; however, attacks can usually be deterred and minor injuries can be avoided by giving turkeys a respectful amount of space. While we attempt to provide guidance about state and federal regulations pertaining to specific species and control techniques, we do not provide information about local jurisdictions (city, town, county, etc.) where regulations may be more restrictive, especially as it applies to discharge of firearms, transport of animals or use of trapping equipment. Contact your local city or county government to inquire further. No guarantee is made that information (or lack of information) associated with a species or control technique is completely accurate or current. You should become familiar with federal, state and local laws before beginning any wildlife control activities. Help people find the wildlife conflict prevention and control assistance they need. Register to be listed on this site. Only Northeast state nuisance wildlife control operators are permitted to sign up on WildlifeHelp.org at this time. If you are from another state, please indicate your interest by signing up for notification when your state is added.